Hempnall Mill Road postmill was working in the 1700s and possibly well before that. James Carver rebuilt the mill c.1806 specially to drive seed threshing and cleaning machinery. On Monday 7 September next between the Hours of 2 & 5 in the Afternoon of the same Day, at the House of John Scales of Hempnall in the county of Norfolk. A WINDMILL now standing in HEMPNALL in the county aforesaid. Having erected a Mill on a new construction for the entire purpose of DRAWING & DRESSING CLOVER, SUCKLING & TREFOIL SEEDS, respectfully informs Farmers & others that they may have any quantity of the above seeds drawen on the most reasonable terms & shortest notice. Warranted not to be the least injured. Drawing was the method of extracting seeds from plants such as clover or trefoil by threshing and then hulling and cleaning them. The Partnership lately subsisting between James Carver the elder & James Carver the younger of Hempnall in Norfolk, Millers, is dissolved, of which their friends & the public are respectfully requested to take notice & that all debts due from the said late partnership will be paid by the said James Carver the elder, who will henceforth carry on the said trade at Hempnall aforesaid, on his ownb account & that all debts due to the said parnership are to be paid to him only, he being fully authorised to receive & give discharges for the same. Witness the hands of the said James Carver the elder & James Carver the younger, this 31st day of October 1807. James Carver, senior, grateful for the many favours conferred during the parnership betweeen himself & son, begs to inform his friends & the public that he continues to DRAW & DRESS CLOVER, SUCKLING & TREFOIL SEEDS (warrented not to be the least injured) on the most reasonable terms & shortest notice, having a Mill constructed for this purpose. James Carver jnr left the business in 1808 to take over the Golden Ball pub in Norwich near what was then the cattle market. 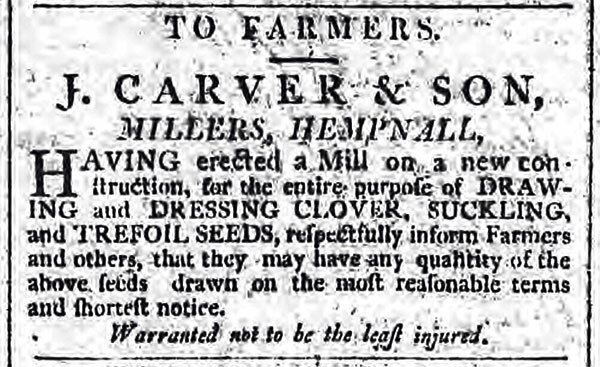 James Carver, Hempnall respectfully informs Farmers & Seed Merchants they may have CLOVER, SUCKLING & TREFOIL SEEDS DRAWN & DRESSED at the shortest notice, having a Mill constructed entirely for that purpose. The great encouragement J. C. has had for many years & still continues to experience is a sufficient testimomy of the Seed not receiving the slightest injury. J. C. earnestly solicits those Gentlemen who intend to have Seeds Drawn this season to send them as early as possible & he may be spoken with on a Saturday at his Son's, Golden Ball, Castle Ditches, Norwich. Some time in the month of March next unless disposed of by Private Contract. A newly erected BRICK_TOWER_WINDMILL, four floors, with a pair of new French Stones & a pair of SEED Stones & Going Gears complete. Also a large POST MILL with two pair of French Stones & Flour Mill & all going gears complete. This mill may be had separate if wanted to remove. The above are in adjoining fields & are situated in Hempnall, near Long Stratton; distant 9 miles from Norwich & 8 from Bungay. Enquire of James Carver, the proprietor, Hempnall. When the towermill was built in 1814, the pair of seed dressing stones were almost certainly taken out of the postmill and installed into the more powerful towermill. A second set of French burr stones were then installed into the postmill in order to fully convert it to flour production.